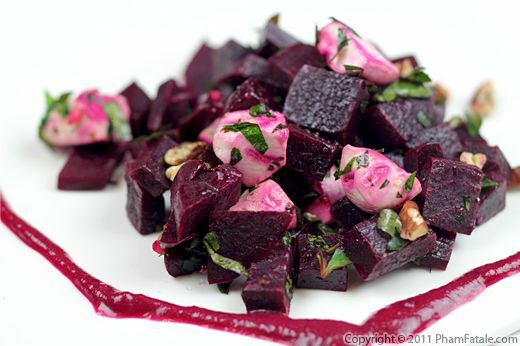 Beet salad dressing is a unique way to flavor your salad. 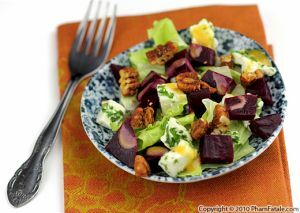 The dressing contains puréed beets, a sweetener (sugar, honey or syrup), vinegar and flavorful oils. The vivid color makes for a stunning start to any meal. I learned this new trick from my best friend Alexia's fiancé during our recent trip to Paris. 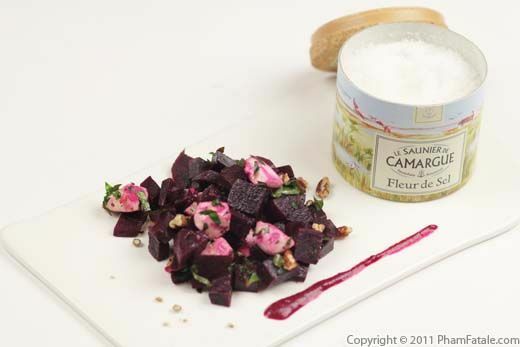 Olivier served diced beets with pieces of goat cheese to give the salad a richer mouth feel. The salad was very simple but insanely delicious. I've been best friends with Alexia for almost 15 years, and even though I've known Olivier for only a few years, he’s incredibly sweet so we’ve all gotten very close. Last December, they got "P.A.C.Sed" (PActe Civil de Solidarité), which is a form of civil union in France, but they’re planning on getting married next year. They haven’t set a date though, so Alexia asked my husband Lulu to bug Olivier about it a bit. So every time we saw them, Lulu and I would find a "subtle" way to sneak the question in the conversation. Alexia thought it was ingenious! We'll keep trying to nudge him until we have another good excuse to go back to France. If you’d like to get in on the fun, leave a comment for Olivier on this post. I’m sure he’ll appreciate the encouragement. Olivier, je sais que tu lis! (I know that you're reading!). We love you two! 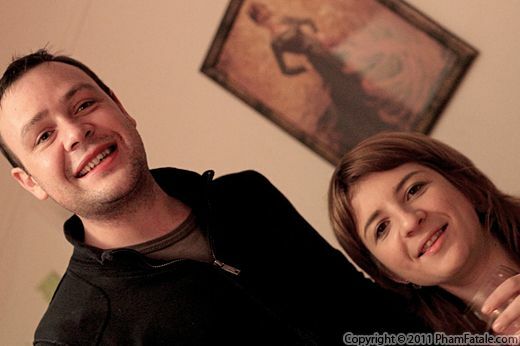 Olivier and Alexia, a.k.a "Darling" and "Pouette". Scrub the beets under tap water. Remember to trim off a little piece from the ends of the root. Reserve the beet leaves for another dish (if any); they're edible. Peel and cut the beets into 1"-thick slices. Fill a pot with cold water. Add a steamer insert, place sliced beets in the steamer and cover with a lid. Bring to a boil, then lower the heat to a gentle simmer. Steam for about 30 minutes until softened, but still firm. Check the liquid and periodically and add more water if all the liquid is absorbed. Remove them from the steamer and let cool completely. Dice the beets into 1-inch cubes. Making beet vinaigrette: In a blender or a mini-blender if you have one, combine ½ cup of diced beets, red wine vinegar, pickled garlic, raspberry syrup and both oils. Mix until the blender flows smoothly. Season with salt and white pepper. Set aside. I served the beet salad dressing with the remaining diced beets, which I mixed with coarsely chopped hazelnuts, diced goat cheese, chopped parsley and finely minced pickled garlic. Toss well. Sprinkle with sea salt and freshly cracked white pepper. Serve with the vinaigrette on the side. Olivier didn't add nuts; I added hazelnuts for a balance in texture but you could omit them. 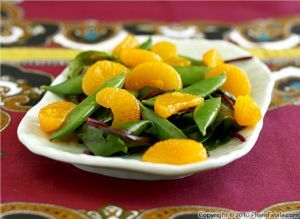 If you prepare the salad in advance, you could chill in the refrigerator until you're ready to serve. 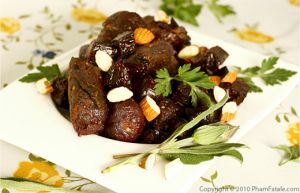 Remove the beets from the refrigerator 15 minutes before serving to bring them back to room temperature. - Rule #5: If unfortunately, you stained your wooden cutting board, use the same technique as you would for removing wine stains; sprinkle a little kosher salt on the stain and spray a little water. Wait for an hour. I used La Tourangelle roasted hazelnut oil. If you don't have any, you could use only olive oil. 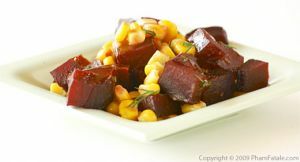 Another great beet combination is caramelized fennel. Published By: Jacqueline Pham on March 1, 2011.